To help you customise your payment page so that it looks like the rest of your website, you can use the basic customisation editor contained with your Account Management System, or with some experience in HTML and CSS you can fully customised your payment page using payment page container files. Using the Payment Page Customisation Editor your can change the colour scheme of a wide range of elements that are displayed on the payment page so that are more aligned with your branding. The Payment Page Customisation Editor also enbles you to simply replace the CashFlows Top Banner Logo with you own Logo or image. When the payment page is then rendered to the shopper the @@PAGE@@ tag is substituted with the payment page content. To change the look and feel of the payment page itself you will need to update the profile.css style sheet containing all the relevant CSS classes used by the payment page. 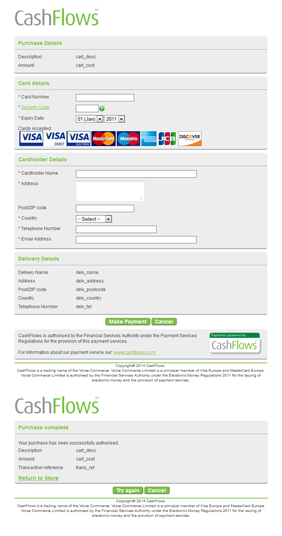 The Payment Page Integration Guide explains how to integrate your site with the CashFlows secure payments pages and provides further details on how to customise the payment page using the editor or by uploading your own design and style sheets.